The look of a business depends on more than the shape of the building it occupies or the color of the exterior paint. In fact, a business’ identity or brand is more than just a logo, product, or service; it’s about overall presentation. 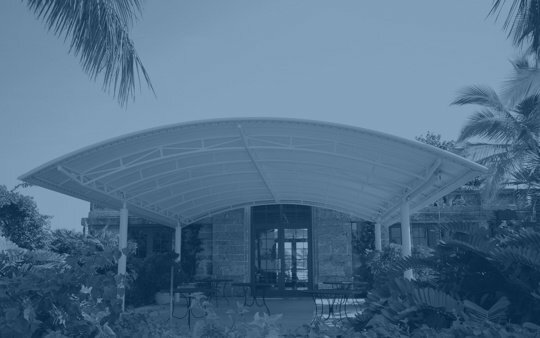 A building with a beautifully constructed awning attracts attention and invites people to come enjoy the shade and walk inside. But as the years pass and the awning fabric begins to fade, a building can lose its charm and luster. This is why it’s so important to keep up with the maintenance of an awning, especially if the shade structure is something every customer visiting the business will see. Awning fabric colors fade with time and sun damage, and tear or rip with time. Once an awning is damaged, the look and feel of any business - whether it is a restaurant, clothing shop, or gallery - diminishes. Potential customers may hesitate to enter your building because of a shabby looking exterior. So how can you as a designer, architect, or business owner remedy the situation? Inspect the Frame: make sure there are no critical breaks, cracks, or other damage that render the awning structure unuseable. Check for Mold or Mildew: look at the frame, the fabric, and the anchor points of the awning to the building to see if there is excessive mildew or mold growth. Sometimes, due to this unsightly growth, an awning needs to be replaced. Fabric: look closely at the fabric of the awning. If there’s a tear, rip, or other issue, this can be replaced easily as long as the frame is still useable. If your awning is repairable you’ve just saved yourself a lot of money. Repairing or replacing the fabric of an awning is simple and inexpensive compared to replacing the entire awning. In fact, replacing the textile of an awning so that your business has a fresh new look is a great way to give your building a facelift without spending too much. Designers and architects are limited by budget and time when it comes to updating the look of a building, so it’s important to know that a simple thing like changing the fabric color of an awning is so cost effective. 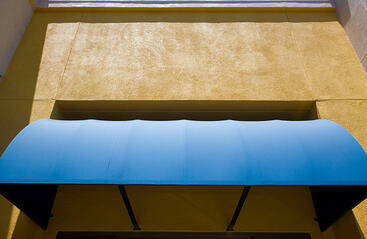 A new awning color can really stand out on a block of businesses with faded fabrics. When you think about the amount of time, money, and effort that it takes to paint and reconstruct the facade of a building and compare that to how fast and easy it is to simply change the color of a fabric the savings are pretty obvious. Keep in mind, though, that not all awning fabrics are created equal. Finding the right awning fabric supplier is essential. Using a quality awning fabric will help ensure the color, durability, and stability of the textile, and a reliable awning fabric supplier will back up its product with a warranty. Herculite Inc. offers an 8-year warranty on its Excel-M Series awning fabric - talk about a steal! Don’t forget that your awning needs to be taken care of and should be properly cleaned regularly to get the most return on your investment. That’s why utilizing resources like PAMA’s awning care tips is important to maintain your shade structures. You rely on your awning for protection from the elements and aesthetic purposes, but damaging effects of Spring, Summer, Fall and Winter weather can wreak havoc on your investment. Download our free guide to learn more about keeping your awning intact, all year long. Copyright © Herculite 2019. All rights reserved.